Born in 1978 as a child of science-fiction obsessed parents, I grew up in the natural knowledge that spaceships are awesome and you just can’t trust a cylon. So it’s no surprise that I’m addicted to creating alien worlds since early childhood – be it in visual art, sculpture or in literature. After vocational diploma and the completed appreticeship to become a digital media designer, I worked in advertising and printing companies, and during that time I had the opportunity to design all kinds of stuff, ranging in size from a tramway branding down to business cards. In the meantime, I have also worked for the iFuB publishing company as an illustrator, and was therefore responsible for the TREKminds Alien Nursery and also for cover and flyer design. From time to time, I have also written articles and book reviews for the well-known online project Corona Magazine. Currently, I’m working as head digital media designer for web and print advertising for an international English Language School franchising company. Among diverse other tasks, I’m responsible for the layout of educational books and childrens’ story books. My best known free work, the webcomic Hive 53 is being published since 2008 and gets updated regularly. 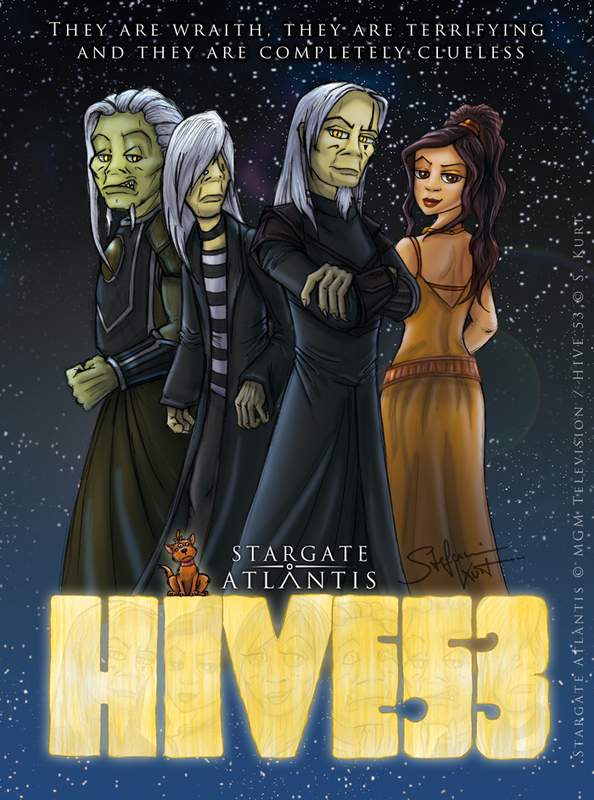 The humorous homage to Stargate: Atlantis is attracting a growing fan community and has already been translated to Russian and Czech by loyal fans. If you are interested in commissioning me, you can find all relevant information here.